This 230v server rack cooling fan tray protects your expensive data networking hardware from overheating. Three cabinet cooling fans are included in this fan tray assembly. Expand to 6 or 9 fans with additional FTM-230 cooling fan assemblies for a much more efficient cooling system. The fans are protected by nickel plated steel fan guards. Fan guards are important for preventing work tools and hands from striking the moving fans, which can force you to replace the damaged equipment and even take the server offline. 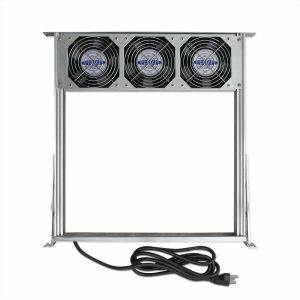 This server rack cooling fan tray assembly is prewired and has a 6 foot power cord for easy installation. Part # FTM-230, 6 or 9 fans.